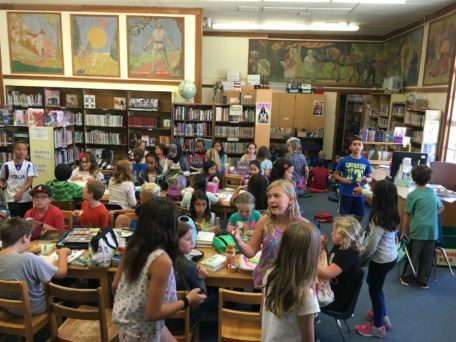 This year for the first time, each elementary school is launching a Mock Newbery Book Club and kicking off Berkeley Unified’s Year of The Reader. The Newbery Award is the most prestigious literary award for children’s literature in the United States, awarded annually by the American Library Association (ALA) (along with numerous other awards). Our Mock Newbery Book Clubs will strive to follow the same guidelines as the official ALA Newbery Committee. We will read and analyze works published in 2016 to determine which author has made the most distinguished contribution to American literature for children. We thought many 4th and/or 5th graders would be interested, especially after the success of Emerson’s Mock Newbery Book Club these past couple of years — but we had no way of predicting the enthusiasm that burst forth at the schools that had their first introductory meeting! At both Malcolm X and John Muir, over 50 students showed up to find out more about the book club and start checking out Mock Newbery Nominees! The rest of the schools are having their introductory meetings over the next couple of weeks. If this trend keeps up, we will be sorely in need of more copies of our nominated books! Between now and mid-January, interested 4th and/or 5th grade students (the participating grade level varies school to school) who are participating in their school’s Mock Newbery Book Club will read at least 5 of the 10 nominated books. Listening to the books counts, too, and make great read-alouds together at home. Some titles are also becoming available on Tales2Go, our audiobook streaming service. There are four mandatory meetings (September, November, and two in January) with informal weekly meet-ups in between. The entire Mock Newbery Book Club project is voluntary, from the librarians, literacy coaches and classroom teachers’ time, and of course at the heart of it, the students. The final discussion and vote will happen before the January 23, 2017, announcement from ALA. Whether we predict the same “winner” that they do, or not, we will have some delightful, thought-provoking reading and discussions along the way, which makes us all winners! Here is the current list of nominated titles for the Berkeley Mock Newbery Book Club. Please consider joining us as we read our way through these wonderful works of literature. It’s a great way to be an active participant in The Year of the Reader! Contact your school librarian or literacy coach, or keep up to date via our Berkeley Schools Mock Newbery Blog at http://berkeleymocknewbery.blogspot.com/. Wondering what’s exciting our middle school readers? Stay tuned for information on the Battle of the Books launch happening in the three BUSD middle schools very soon.